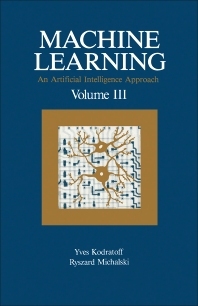 Machine Learning: An Artificial Intelligence Approach, Volume III presents a sample of machine learning research representative of the period between 1986 and 1989. The book is organized into six parts. Part One introduces some general issues in the field of machine learning. Part Two presents some new developments in the area of empirical learning methods, such as flexible learning concepts, the Protos learning apprentice system, and the WITT system, which implements a form of conceptual clustering. Part Three gives an account of various analytical learning methods and how analytic learning can be applied to various specific problems. Part Four describes efforts to integrate different learning strategies. These include the UNIMEM system, which empirically discovers similarities among examples; and the DISCIPLE multistrategy system, which is capable of learning with imperfect background knowledge. Part Five provides an overview of research in the area of subsymbolic learning methods. Part Six presents two types of formal approaches to machine learning. The first is an improvement over Mitchell's version space method; the second technique deals with the learning problem faced by a robot in an unfamiliar, deterministic, finite-state environment.